If you don’t, then you don’t need a will because if you die without a will, the law will make one for you! This essentially means that the provisions of the Succession Law Reform Act (the “SLRA”) will apply and your estate will be distributed in accordance with the SLRA depending on your unique situation. However, if you are not satisfied to have the administration of your estate to be governed by the SLRA and want to be proactive about issues such as the custody and guardianship of children, who gets what after you die, minimize taxes and other government fees (levied on your estate or your beneficiaries), and making sure that your preferred charities and friends receive any bequests you would like to leave them then you do need a will. In this situation, the SLRA provides the surviving spouse is entitled to the deceased’s property absolutely. Should you wish others to benefit from your estate then you need to set this out in your own Will. In this situation, the SLRA states that the surviving spouse gets a preferential share. The balance is divided between the surviving spouse on the one hand and the children on the other. The preferential share of an estate is $200K. If it is your intention that your spouse should receive the whole of your estate, and your estate has a value of less than $200K, you may not need a will if the only purpose would be to transfer your property to your spouse. If your estate is greater than $200K, the SLRA provides that if you are survived by a spouse and one child, the balance is divided equally between your spouse and that child. If your estate is greater than $200K and you are survived by a spouse and more than one child, then your spouse will get one third of the balance, and your children will divide the remaining two thirds equally among themselves. The SLRA makes no distinctions between first and second marriages. So, if a person dies without a will and is survived by a second spouse, the second spouse will take the preferential share and divide any balance with all of the children of the first marriage. If both parties to the second marriage have children from an earlier marriage that they wish to protect, it is essential that they both have a will. If they do not, on the death of one of them, the surviving spouse would inherit from the estate of the other assets having a value equal to the preferential share of $200K plus a share of any balance. In most cases, that will be the whole estate. The children of the party first to die will receive a share of the surviving spouse’s estate only if the surviving spouse makes a will leaving a share of his or her estate to them. In this situation, the SLRA will divide your estate equally among the children. If any child has predeceased his or her parent, and such child in turn has children (that is, grandchildren of the person who has died) such child’s share is divided equally among his or her children. It does not go to the spouse of such child. If such child had no children, his or her share is divided equally among his or her brothers and sisters. First off, the rights of a common law spouse are not the same as those of spouses who are married. A common law spouse has no property interest in the estate of the other common law spouse. Accordingly, if one of them should die without having made a will, the other would not be entitled to the deceased’s property. The surviving common law spouse might have a claim for support from the estate as a dependant, but would not be entitled to assets by virtue of their relationship. So, if you are living in a common law relationship with another, you will have no protection on the death of the other unless the other has a will naming you as the beneficiary. In this situation, if the person is survived by a parent or parents, such parent or parents inherit the whole estate. If the person who has died has no surviving parent or parents, his or her share is divided equally among his or her brothers and sisters. If any of them have predeceased the person who has died, the share of such brother or sister is divided equally among his or her children. It does not go to the spouse of such brother or sister. You should now be able to determine whether or not you need a will. The benefit of having a Will is that it speaks for you from the moment of your death. It allows you to decide who will look after your affairs, who is to inherit what they are to inherit. It allows you to benefit family members, friends, organizations or charities which may not be possible if you died without a Will. A simple will drafted by and executed in the presence of a lawyer at Blue Letter Law will typically cost you between $300 to $500 + HST and Disbursements. 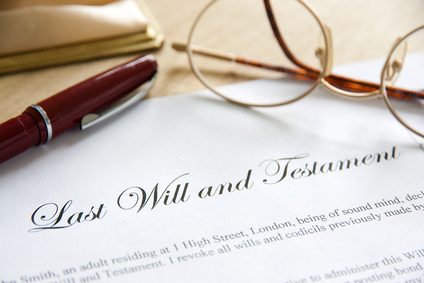 Complex wills that require setting up trusts, tax planning, conveyances of property etc. will generally cost more (based on time spent by the lawyer). One can also purchase ready made (Do it Yourself) will packages from Grand & Toy, Staples and other stores (or even online). These are effective but only if you are able to understand the terms being proposed and can competently (without ambiguity) set out your wishes. When attempting to make the wording fit the framework of the form, making errors is easy. Any drafting mistake can cause misinterpretation and even void the Will. It often takes a court, and solicitors, to sort it out. Expenses are taken from the estate.